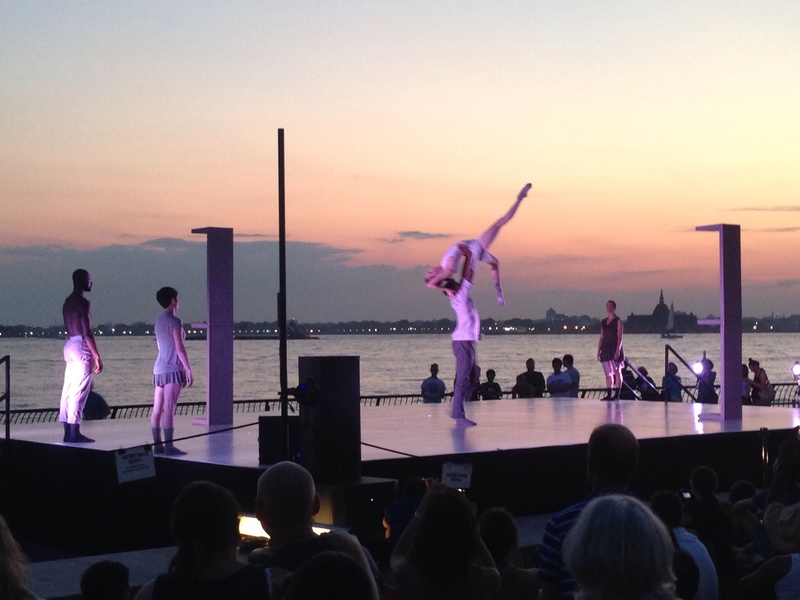 One of the best parts of a New York City summer is the plethora of outdoor dance performances that seem to spring up all over town. 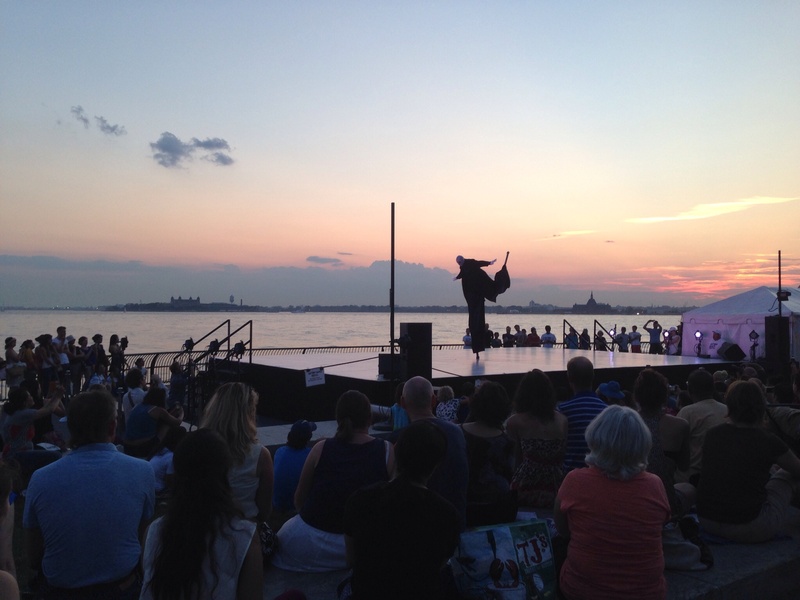 From the Rockaway Beach to Bryant Park, dancers are taking to the streets, connecting with new audiences and energizing all sorts of public spaces. It’s a special thing to being dance to the masses, and it’s what Battery Dance Festival does best. 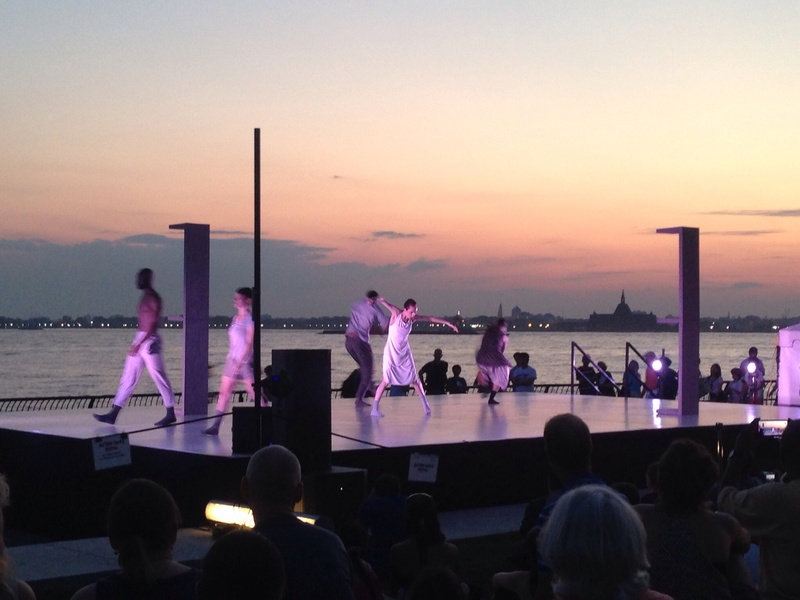 Organized by Jonathan Hollander and his company, Battery Dance, the festival celebrated its 34th anniversary last week with a series of performances in Robert F. Wagner, Jr. Park (as a company, Battery Dance is celebrating a concurrent 40th anniversary) . Battery Dance is particularly well-known for two objectives: representing and showcasing the dance community of Manhattan’s southernmost neighborhoods (“downtown-downtown,” as some call it), and promoting cultural diplomacy by traveling the world as ambassadors of American dance. At home in New York, they help to present foreign dance artists who have little exposure in the United States. As a director, Mr. Hollander has also supported the independent careers of his company members, and has presented many Battery Dance alumni in the annual Festival. Sunday night’s program included a little bit of everything that Battery Dance Festival has come to stand for. The program included contributions from former and current Battery Dance company members, the world premiere of Tadej Brdnik’s new work for Battery Dance, and performances by international artists Asia Duo, Sankofa Danzafro, and Polish Dance Theatre. The offerings ranged greatly in both style and caliber. “Pleased 2 Meet U,” a well-traveled duet by former Battery Dance company member Tony Morales and performed by two women from MoralesDance, mixed ballet vocabulary with playful theatrics and partnering. Brooklyn-based Indelible Dance Company, led by current BD-dancer Robin Cantrell, presented excerpts of their 2014 work “Wonderland,” including a duet that showed off the long, lithe limbs of dancer Giorgia Bovo. Asia Duo’s piece “Draw-err”, the joint effort of Fairul Zahid (from Malaysia) and Yachao Zhu (from Beijing), provided more than just moments of exquisite dancing; they exemplified the international collaborations that are becoming increasingly possible and popular as the global dance community becomes more integrated in the digital age. Midway through the program, Colombian group Sankofa Danzafro took the stage with a jolt of energy that surged throughout their entire performance. Featuring a live drummer and flutist, their work La Ciudad de Los Otros portrayed the harshness of city life. Dressed formally in white shirts and black pants, the dancers sprung to life like overworked employees letting loose on Friday night, jamming out with fast and furious jumps and turns and crafting compelling rhythms with their footwork. When the festival’s hosts took the stage, their capability to work as an ensemble featured strongly. For their first work, Battery Dance company member Sean Scantlebury’s Terra & Astra, two pairs of dancers negotiated the space in the manner of atoms, colliding, separating, and rejoining in new formations. Scantlebury’s molecular inspiration was quite clear as the dancers leapt into each other’s arms, swept each other across the stage, and maintained tension between their bodies through precarious counterbalances. The company closed the program with Inter/Ago, a work for five dancers by acclaimed Martha Graham dancer Tadej Brdnik. Mr. Brdnik is a seasoned professional, and he has an eye for arranging movement cohesively across the stage; the alternation between sharp slicing motions and soft swirling ones suggests the ebb and flow of a delicate wave. As the dancers transitioned from duets and trios into full cast quintets, sometimes pausing to watch each other while seated on set pieces designed by Reynaldo Then, Brdnik renders an overarching sense of care and compassion between the performers. As they gently catch each other under the arms, breaking falls without stopping momentum, we sense that they dance both with and for each other. The most captivating performance of the evening, however, came from Polish Dance Theatre. The group from Poznań started off with an excerpt of Artistic Director Ewa Wycichowska’s It’s Already Dusk. Based on the duel with Death from Ingmar Bergman’s film “The Seventh Seal,” the excerpt opens with six dancers gradually falling to the ground and being helped back up, until an ominous figure of Death takes the stage. Death is intimidating, looming on stilts over the dancers, but all presumption falls away when he begins practicing a few balletic steps of his own and conducting the audience to orchestrate their applause. Though they had traveled thousands of miles to make their New York debut, the dancers were completely at ease. Not even a boatful of hecklers passing the park could disturb their performance. The dancers are independently skilled technicians, but their ability to coalesce on stage was particularly striking, and this showed especially well in the second half of their performance, an excerpt from Takako Matsuda’s Thousand Colours. The section they performed was very lively, reminiscent of revelers sharing their party tricks as dancers take turns to break from the pack to show off a special jump or a quick, exuberant turn. There’s a lot going on, but Matsuda has carefully organized the choreography to keep the space from feeling overwhelmed by movement, and the dancers are likewise careful to hit their marks and keep time without losing the casual feel of dancing for pleasure. I have a feeling this will not be the last New York City hears of the Polish Dance Theatre. Speaking with Andrzej Kryczka, the company’s Foreign Relations Manager, after the show, he explained the company’s impulse to share Polish contemporary work both at home and abroad. “Whatever treasures you have,” he says, “you try to bring those treasures to the world.” In their home town of Poznań, the company takes a holistic approach when assessing its purpose in the dance community. The company strives to provide its dancers with versatile work by giving multiple premieres each year, and offers opportunities for dancers to explore and develop their own choreographic voices. As an educational body, Polish Dance Theatre hosts community classes and workshops. In fact, Battery Dance company members will travel to Poland later this month to teach at Polish Dance Theatre’s own long-running international community dance festival, Dancing Poznań. Indeed, Mr. Hollander’s vision of cultural exchange is materializing before our eyes. 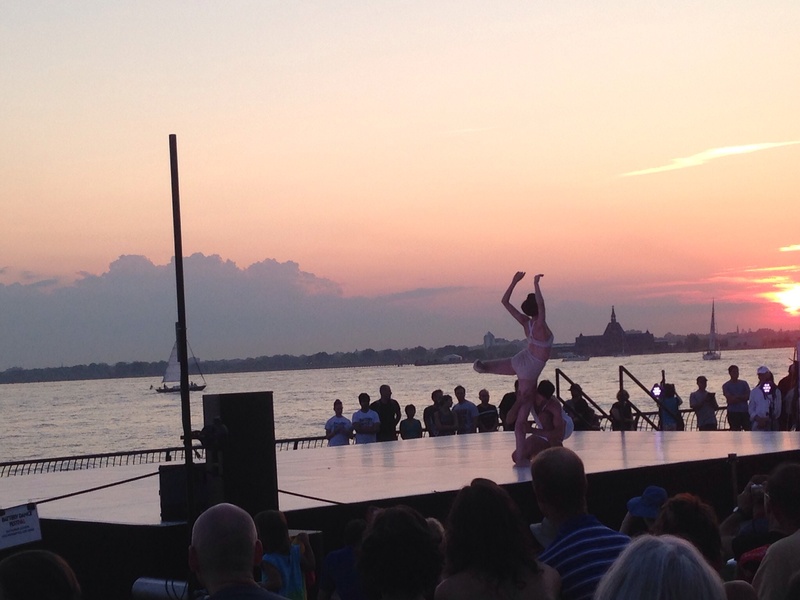 As the sun sets over New York Harbor, here’s to many more years of sharing the dance world’s treasures with the people of New York City.